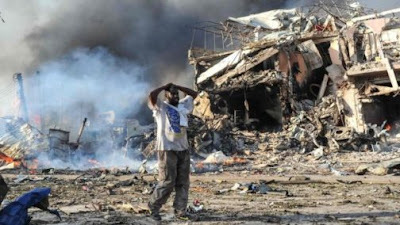 Police today confirmed that 300 people died after multiple bomb explosions in Mogadishu, the capital of Somalia. Local residents were seen packed in hospitals in search of relatives and friends caught up in what authorities described as Somalia’s deadliest suicide bombing. Authorities told Reuters today the death toll has risen since Saturday when suspected terrorists struck at two busy junctions in the heart of the Mogadishu. No terror sect had claimed responsibility for the deadly attack. This is a religion that is founded on evil. Evil,terror, bloodshed,unspeakable act of horror is there hobby. They love it when people die of terror attacks. The religion is epitome of evil and it serve the interest of there god-satan the devil. What on earth could justified this massive attack that led to the death of uncountable people? Isn’t there a way to solve the problem of power tussle? Must it be through violent attacks? Devilish religion that lack the presence of God in it midst!